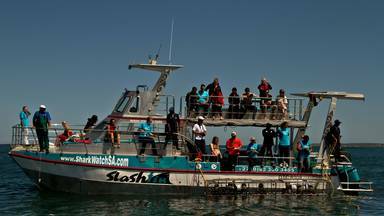 Great White Shark Diving in South Africa and more specifically a trip on the Slashfin, is a combination of Goosebumps, thrills, education and relaxation on a luxury boat in the company of experienced experts and researchers! They will show you how to distinguish between a male and female shark and how to identify a specific shark by its unique dorsal fin and scars. The 20 - 25 minute boat trip to where the activity is to take place, is by itself an exhilarating adventure. Marine conservation has historically been grossly neglected and this vacuum in the scientific arena necessitates new, exciting and ongoing research projects to find out more about our precious marine species and the ecosystems in which they live. And this is exactly what we do! 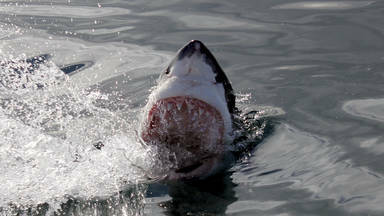 Every trip on our shark cage diving boat is an awesome adventure and an exciting crash-course in marine biology, educating you about the trends, traits and troubles of the endangered Great White Shark!